Gleason Fournier (right) pictured with Cardiff Devils managing director Todd Kelman. Pic: David Williams. Smooth-skating defenceman Gleason Fournier, who has enjoyed a remarkable Elite League season, insists Cardiff Devils rekindled his love for ice hockey. The 27-year-old from Rimouski in Quebec played in all 60 League matches for Devils and scored an astonishing 71 points (24 goals, 47 assists). A year ago, in the Devils office at their Viola Arena home in Cardiff Bay, Fournier admitted he wasn’t sure if he wanted to carry on playing. He was concerned at the potential expectation and pressure that would fall on him after Andrew Hotham, described by Devils general manager as the ‘best defenceman in the history of Elite League’, retired. Fournier, though, rose to the challenge in style and finished sixth overall and leading defenceman in the League scoring lists. He surpassed even Hotham’s scoring achievements during the most successful season of his career. Now, though, he is delighted to have returned for a fourth season in Cardiff and is fired up for the Devils’ play-off quarter-final matches against Sheffield Steelers this weekend. The first leg is in South Yorkshire on Saturday with the return at Cardiff’s Viola Arena the next day. 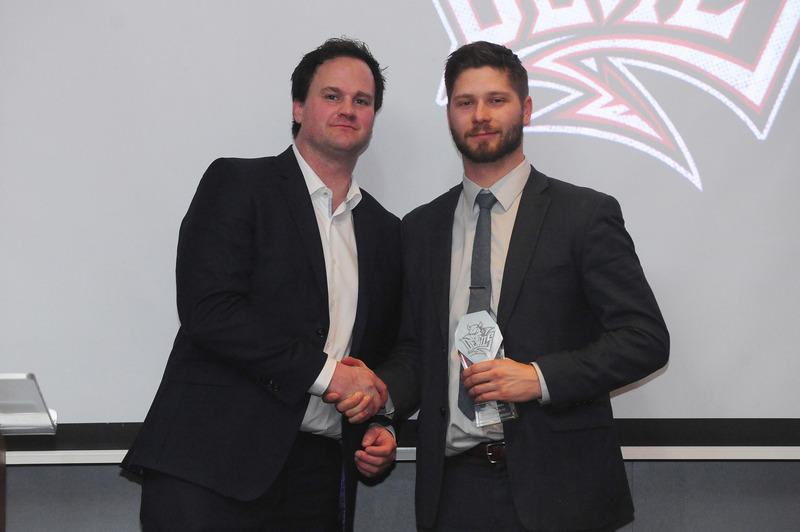 “It’s been great,” said Fournier after winning D-man of the season and Most Valuable Player during the Devils awards night at the Radisson Blue Hotel in Cardiff. “When I first signed my expectation was that I would go to business school for a year and then retire. But Devils have changed my life. "He skates with the grace of a Swan 🦢 & the wrist shot has the venomous bite of a Rattlesnake 🐍"
Fournier met Devils defence coach Luke Piggott at the end of last season and talked about his concerns over Hotham’s departure, saying: “I didn’t want people thinking I was the new Hoth. French-Canadian Fournier, aged 27, joined Devils from East Coast League Alaska Aces in 2016 after a decade of playing in North America. “Gleason is one of the best, if not the best skater in the EIHL,” says Devils coach Andrew Lord. “He has an ability to pick up the puck in his own end and go coast to coast with ease, but his speed lets him always get back into position on defence. He was a Calder Cup winner with Grand Rapids Griffins, while he has playing a major role for Devils when they won two League titles, the Challenge Cup twice and play-off championships. Devils missed out on winning a third successive League title after finishing level on points with Belfast Giants and the newly-crowned champions have also lifted the Challenge Cup and Erhardt Conference. Giants are going for a clean sweep of trophies in the play-offs where they take on Coventry Blaze, while Devils face Steelers. Cardiff-born Sheffield captain and former Devil Jonathan Phillips believes his team can cause an upset, saying: “We can beat Devils but only by sticking to our game plan for 120 minutes. “We’ve shown when we do that we are as good as any team in this league. It’s when we come off the plan that things go wrong. “I expect we will face a motivated and angry Devils side. They will be hurting inside from the way the league went. Welshman Jonathan Phillips is Sheffield Steelers’ captain. “They have shown over the last few years that they have character and will want a reaction to their hurt and disappointment. “We have to put pressure on them early. If we can score first and put some question marks in their mind. “Devils have been – and to me remain – the target club.